Social supermarkets (SSMs) have developed as an unique retail format across several European countries. SSMs sell food and consumer products at low, symbolic prices to a restricted group of people living in or at risk of poverty. The products offered are mainly provided free of charge by partnership companies (e.g. manufacturers, retailers). While these products are consumable, they are not saleable anymore because of e.g., minor quality deficiencies, surplus production, or proximity to the expiration date. SSMs are mainly non-profit organizations and operate with the support of volunteers. Besides their social contribution, SSMs play a key role in supporting the reduction of food waste in the retail sector. Several ECR-Initiatives are actively working on the topic of food waste reduction and mention SSMs are an example for a successful co-operation of various partners along the food supply chain. 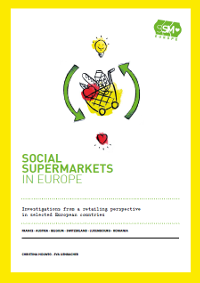 The recently published report „Social Supermarkets in Europe – Investigations from a retailing perspective in selected European countries” provides the first international overview and analysis of SSMs in Europe. Following the start of the first SSMs in France in the late 1980s, the report shows the development of SSMs across six European countries. With a total of more than 1000 stores, SSMs have existed in France, Austria, Belgium, Switzerland, Luxembourg and Romania for several years. The report illustrates how SSMs operate with regards to e.g., their assortment, pricing and service strategies. It further explains their logistics and processes and illustrates the various forms of co-operation with partnership companies. Success factors and challenges provide insights into the potential of further co-operations between SSMs and multiple stakeholders in the food sector. The key target group for the report is companies along the food supply chain (retailers, manufacturers and logistics providers), networking groups and platforms related to the topic of food loss and food waste, food rescuing organizations, and governmental as well as research institutions. Authors: Dr. Christina Holweg and Dr. Eva Lienbacher, Institute for Retailing & Marketing at WU Vienna University of Economics and Business and Academic Partner of ECR Austria. The report „Social Supermarkets in Europe – Investigations from a retailing perspective in selected European countries (2016)” is available as hard-copy (110 pages) at the cost of €49.90 under handel.marketing@wu.ac.at.